Fall/Winter Trends: Peplum, Leather, and Gold…Oh My! A collection of Winter Trends including a beautiful quilted purse, leather Balmain skirt, and Military Styled Abaya. The smell of new leather fills the air with a tart unmistakable aroma. Knee and Anklet booties click clack across the tiled mall floors alongside the quiet shuffle of a preteen’s favorite pair of sheep skin shoes. Fall has definitely arrived and on its coattails comes a bevy of warm hues, trenches, and the latest in layering trends. My journey so far as a mother is compelling me to write a few words about the strongest bond ever named ‘’MOTHERHOOD’’. Well going back to my past, when I was about to get married even I had dreamt a lot about being a mother but then I think I was too un matured because for me it was just an emotional feeling mixed with joy, pain of labour, making your husband a proud father and getting a new doll to play with. I never realized how big a responsibility Motherhood is until I really did experience. I guess it’s somewhat same for all young mothers. My daughter is just 2, I know all mothers reading are thinking it’s not yet time for me to write about it. But trust me I have changed a lot and I want to share the feeling with all mothers and mothers to be. Before being a mother of course were all so independent, we have time for household works, for browsing, for home facials, for chatting, for prayers and Quran, for shopping’s, for gatherings etc, etc.. The first day as a mother I realized this is no doll nor just a cute feeling…The baby in my arms is the biggest blessing I have ever received, and it’s my responsibility to bring her up as a good human being and obedient Muslimah. The most challenging task for every parent. Motherhood really did change me; it made me more patient, more affectionate, more loving, more understanding and far more humble. The greatest achievement was I realized the pain my parents must have gone through bringing me up. Now I don’t know how I spend my time before my sweetheart was born. Sometimes I feel I’m being ungrateful when I keep complaining that I don’t get time for myself, I’m getting too tired, I want to sleep properly for one night, I want to eat without botheration.. I sometimes imagine the state of mothers with mentally disabled kids, or babies with heart problems, or a handicapped child…Every time you look into your kids eyes you will feel the pain.. Ya Allah give patience to all such mothers and bless every woman with a healthy baby. When a lady gets pregnant all around her gives 101 tips..Being a mother for the first time she would really be confused what to do and what not to. Some even tell to drink milk with saffron so as to get a fair baby. Let’s realize no color, no brains; no body can be attained without Allah’s consent. What a carrying lady should do is trust in Allah and pray to get a Healthy baby which is most important of all. Let us not forget to prayer for all those couples who are married for years and are desperate for a baby. May Allah bless all such couples, also those mothers who could not experience motherhood even after carrying and giving birth to her child May Allah bless them with better kids and make life easier for them. This Quranic verse is a proof for mankind about the hardship a mother undergoes in bringing up her child. Quran warns us to be grateful to our parents and Allah reminds us that we all return to him and will be questioned about out acts. When her tiny arms are around my neck the innocent love makes my day, when her tender lips touches my cheeks I forget all my worries, When she cries I lose concentration, when she is about to fall my heart skips a beat, when she’s hurt i feel the pain, when she doesn’t eat it keeps me worrying the whole day, the sound of her giggle keeps me lively, when she is happy I simply feel good and finally when she sleeps for long I really really get bored. All mothers reading this lets make sure we never utter any word against the blessing and make sure we bring up our kids in the right way not just loving them but being a living example for them. Kids may not learn what we teach them but for sure they will grasp everything we do. Dr. Stef Keris is a polyglot(6 languages) with a German and British education, who has made it his aim to educate us about our Islamic Heritage. He has written three books which will be for sale at his lectures and on his website insha Allah. Find out more in the interview! Assalaamu Alaykum Wa Rahmatullahi Wa Barakatuhu, Dr. Stef Keris welcome and thank you for having this interview with ILM Online. Wa Alaykum Salaam Wa Rahmatullahi Wa Barakatuhu, thank you and I’m honored to be here. Dr. Stef, what inspired you to write your first book? Well, I would have to say my background and school experience as a Greek. I found out that our teachers were lying to us about the Ottomans in Greece and that pushed me towards Islam and towards finding out more about Ottoman Greece. Why and when did you become Muslims? I have a Greek background but was raised in Germany where I had some contact with Muslims from Bosnia, Turkey and other countries. When I was going to Greek primary school in Germany we used to learn a lot of lies about the Ottomans (Turks), as I found out later. I couldn’t believe everything so I started doing my research and found out that they lied to us. After I became close friend with a Lebanese Muslims when I was 15, I experienced daily life of practising Muslims and loved the salah. So, after a real struggle of about 3-4 years I started going to the masjid and started learning how to pray. This led me to saying the Shahadah in 1992, Alhamdulillah. How did you come up with the titles? Well, the series is called ‘The hidden Islamic heritage of our world’. I feel that it is hidden, especially in the West, where we don’t know that much about the Islamic heritage in Europe, America, the Caribbean, Australia etc. Is there a message in your books that you want readers to grasp? The message is we have a great Deen and civilisation with a great past that we need to learn more about to become a proud nation again. What pushed you to do research and to write about the Islamic Heritage in the world? Well, as I said I am Greek and became Muslim 20 years ago. My home country’s Ottoman history pushed me to find out more about Greece and the Balkan Peninsula, the Ottoman Empire and Turkey. Do you recall how your interest in writing started? As a researcher, you are automatically busy with writing a lot and that has become my second nature. What books do you read as a historian? I read books about Muslim minorities in Europe and history about the Ottomans amongst others. Yes, every book and documentary focuses on a specific country or region. So, I need to visit them myself. It’s hard work but I love it. What was the hardest part of writing your book(s)? The research I had to do and finding authentic material. Did you learn anything from writing your book(s)? Oh yes indeed, with the research I learn every time something new and I am really surprised that there is always something to learn, Alhamdulillah. What were the challenges (research, literary, psychological, and logistical) in completing your book(s)? Well, first of all I have to divide my time between my seven children, my wife, daily routine, research and work. That is quite challenging. Then, the research for authentic sources starts and never ends really and then there is the travelling which is time consuming and sometimes expensive. So, it can be tough just to write one book or to produce one documentary, but Alhamdulillah also very rewarding. I am working on my Islamic Heritage lectures in Birmingham and Manchester and my next books (Islam in the Caribbean, South Africa) and documentaries in those countries. Anyone who wants to find out more about Dr Stef Keris, his courses, documentaries and books can visit his website www.stefkeris.com or write him an email on info@stefkeris.com. Follow Dr.Stef Keris on Twitter and Face Book. Check his YouTube channel, too. The whispering comes from deep inside telling you ‘’you don’t have to show off that you are a spiritual person, it’s between you and Allah’’ true?? 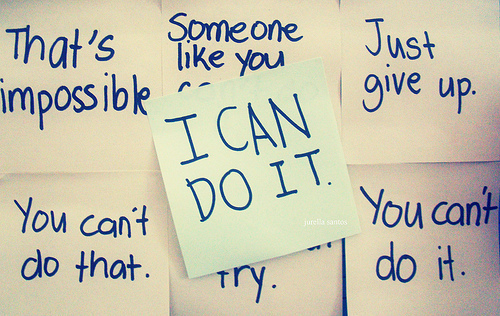 Take that small step towards Allah and see how Allah will change your life, every hurdles will seem easy. The first leap is will seem difficult and shaithan will try hard to stop you from doing it because once you are in Allah is gonna take you closer to him. It can be a habit of saying Bismillah, Alhamdullilah, In sha Allah in different situations of life if you are not yet doing it, or it may be covering your head for the sake of Allah, or starting to include small sunnahs in life with the intention that you are doing it for the pleasure of Allah. Let’s stop worrying everything else but Allah and his unconditional love. It’s Ramadan! Time for early morning meals, sundown feasts and late night prayers. You want your child to learn the rituals of Ramadan, because Ramadan is one of the pillars of faith of our religion. Why not start out by getting him in the habit of getting up for the early morning suhoor meal. It’s full of blessings and can give your child the energy he needs to make it through the day on an empty stomach. Although suhoor is an important start to a day of fasting, parents sometimes have a difficult time getting their children up for suhoor. Here are some helpful tips on how to wake up your child for suhoor. First, make sure your child is getting sufficient rest throughout the day. A well rested child is easier to wake up early in the morning than one who is in need of rest. Try to ensure that he’s getting his required hours of sleep per day. Children aged five to ten need daily about 10 to 11 hours of sleep. Youth over ten years need about 8 to 9 hours a day of sleep. Attempt to get your child to bed on time. It’s common to stay awake into the wee hours of the night making up for lost eating time during Ramadan, but seek to avoid keeping your child up into extremely late hours of the night. That way, waking up early will be much easier on his body both physically and mentally. Grandma Jeddah is a teacher of over 30 years and a mother of 11 children and grandmother of 13. She is the author of Discipline without Disrespecting: Discover the Hidden Secrets of How to Effectively Discipline your Muslim Child—And Keep your Peace of Mind While at It. To order her book or subscribe to her free newsletter, please visit: http://www.grandmajeddah.com. ILM Shares Online Treasures with you! Halfway through Ramadan. The alarm clock went off on time. Bleary-eyed, I stumble to the kitchen to make suhoor, the morning meal that is supposed to sustain us throughout the day of fasting. I stand there in front of the refrigerator, staring at the contents, contemplating what to make. I start rummaging through yogurt containers, none of which actually contain yogurt. Hmm… cucumber salad, leftover pasta, chicken livers. Nope. I open the cupboards that I just cleaned out the other day, casting my eyes over cans of corn and tomatoes. 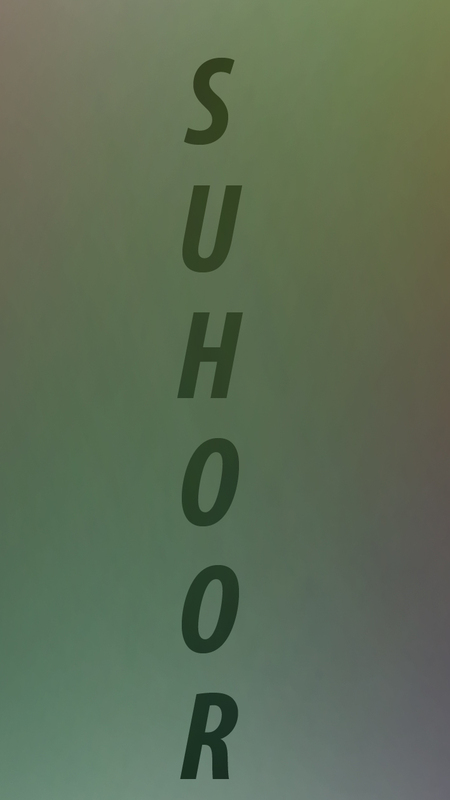 Nuh-uh. Finally my gaze falls on a carton of eggs sitting on the counter. I default to egg sandwich mode. I really don’t want to cook anything but I can’t stand the idea of making a smoothie. The blender would be way too loud, and I know the blueberries had partially thawed before I put them in the freezer and I’d have to hack off a corner from the bag with a butcher knife in order to get enough to use. Sigh. At least I can cook an egg on autopilot. Skillet on, lube it up, crack eggs, put toast in toaster. Grab cream cheese. Stand over eggs, watching the egg white solidify, breaking the yolks with a corner of the spatula. Jump in surprise as the toast pops up. Flip eggs. Turn off heat. Schmear cream cheese on toast. Deposit eggs on top. Take to table, fetch bottle of water from fridge, place everything in front of husband and son. Sit. Contemplate package of danishes on table. Cream cheese danish? Nah, raspberry, bleh. Open package of danishes and eat anyway. Drink from son’s cup of water. Look at bag of dates. Sigh. I believe you could say I have hit the suhoor wall. I’m not a morning person. I don’t like to get up in the dark and then have to function. I don’t like to eat when I first wake up. I can barely manage a desultory “salaam alaikum” to my husband and son. I started out okay. Like most people, I began Ramadan in high spirits with high energy. I made nice breakfasts of turkey bacon and eggs. I served delicious high-protein energy drinks and made pretty plates of dates and cheese. I turned on the lights to wake myself up, jollied myself along, and even stayed up after fajr and read Qur’an. For the last few days, though, I’ve been slipping. Now, I’m at the point where suhoor is going to be a ziplock bag full of dates tossed on the table and a cup of water and you darn well better like it, bub. Half of Ramadan left. I think I’d better go to the store to try to find inspiration and something new to make. That or hire a personal chef to take over the duties from here til the end of the month. I’m sitting here now at the dining room table typing and the adhan is going off on the computer downstairs in the office. It filters through the floorboards and sounds muffled,. I haven’t heard this particular adhan before. Sounds nice. The call to prayer rouses me a bit and I figure I’m ready to go make wudu and pray the fajr. I’ll ask Allah to forgive me for my lack of enthusiasm this morning, and thank Him for providing me with enough food to serve my family, and the electricity with which to cook the eggs, and the fresh clean water to drink. If the baby doesn’t wake up, I might try to go back to sleep, or I might force myself to turn on the light and read for a bit so I don’t get behind on my daily Qur’an portion. First I have to get up from this chair though, so excuse me while I blink the last of the sleep from my eyes and try to find where I left my prayer dress. Yawn. A new day is beginning and though I’m not the most energetic person, I feel good that I did manage to wake up and feed my family a meal, however simple, and spit in the eye of Shaitan who would encourage me to burrow under the covers and go back to sleep. To hell with you, Shaitan. I did it. I woke up. So there. Why is it so? ?Let us consider the pillars of Islam except fasting everything can be used to show off that we are religious.But coming to fasting, do you think its possible?? “Every action of the son of Adam is for him except fasting, for that is solely for Me. I give the reward for it. ” These words of Allah shows how much he loves the act of fasting from his believers.Fasting is more of a spiritual act than a physical one, that is why it is impossible to flaunt it in front of others.It is a sacred devotion we submit to our god. Many people have a feeling that we believers are asked to starve just to know how the unfortunates undergo everyday.But let me tell you brothers and sisters that it is just one reason,there are numerous benefits of fasting some of them even we do not know. When we fast its not just our stomach that is fasting, our eyes, our tongue, our ears, our hand, our legs and most importantly our mind are in a state of fast.We are supposed to abstain from seeing what is forbidden, hearing what is haraam, raising our voice, gossiping and behaving in an unpleasant manner. The main benefit of fasting is that when we are hungry we remember we are fasting and that reminds us we are taking the effort for Allah and should not allow the reward to be washed out.Thus we gain energy automatically to do more spiritual deeds and be at the best of our character even while we are drained out completely. We show kindness to kids, respect the old, love our family and be friendly to others. In short we gain a strength from within to get hold of ourselves , and we unknowingly develop such good manners which we were unable to own while our appetite was fulfilled. Yes, indeed fasting is a shield for us in all manners.Give it a thought..We should use this shield as much as possible.If our body can fight so can our minds.All our deeds are going to be rewarded depending upon our intention for Allah (swt) looks into our hearts. This is truly a wonderful saying which reveals that fasting is an act which has a definite reward.Of course we are happy while breaking fast but think of the eternal bliss!!! So don’t you agree that fasting is a wrapped devotion we do for Allah alone?? It is a private business between each soul and his Allah.Keep it sacred and confidential. Aysha was so excited that her mom allowed her to fast this Ramadan as she turned six. She has been asking her mom’s permission to take fasting from last year but was not allowed since she was a kid. She herself felt she has grown up within a year. 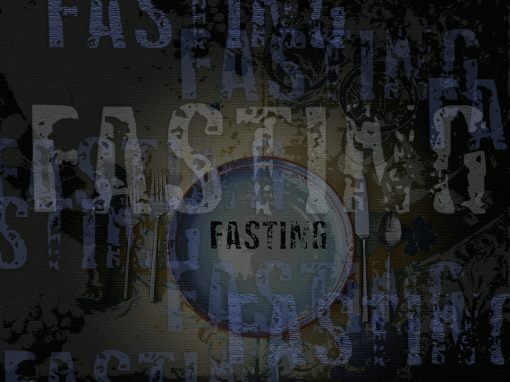 It was not just the thought of fasting that thrilled her, but the gift she will be offered if she completed one whole fast. Yes, little Aysha loved to dress up like her elder sister who wore salwar (Pakistani traditional dress) with duppata (stoll) along with it. She always wanted to own a salwar suit like her sister and her mom promised her a new salwar suit with duppata as soon she opens her first fast. It was a Sunday, and Aysha was called early morning for Suhoor and prayers. She was so excited that she woke up even though was very sleepy, had food, did her prayers and when back to bed to get some sleep as she didn’t have school. From the time she woke up her mind was full of thoughts how her new suit will look, she just couldn’t wait for magrib azaan. It was time for Zuhr and Aysha realized that her stomach started complaining already, she felt thirsty too but kept quiet as she didn’t want break her fast. ‘’Aysha dear, are you very hungry? Soon it was almost time for Magrib and the table was being filled with different food items for the family. Aysha was the first one to be seated, her beautiful face was shining with happiness and the water after wudhu dripping from her chin made her look prettier. 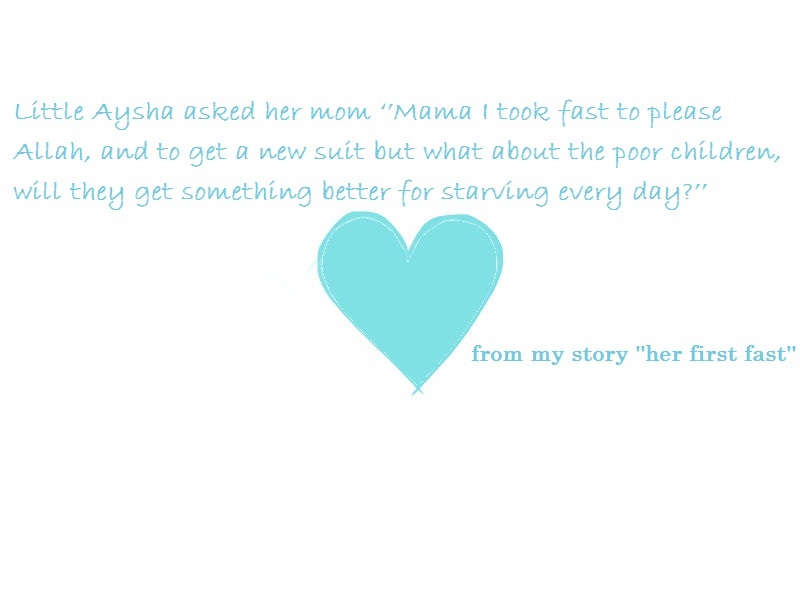 Her family couldn’t help laughing seeing how hungry and eager Aysha was to break her fast. The most awaited azaan breaks the silence, Aysha and family breaks their fast with dates. Aysha started eating each snack as fast as she could as if trying to stop her stomach from making noises; she drank water and felt that water never tasted so good ever before. ‘’Daughter, its Allah who gives us food and money and we are supposed to feed the needy, and by doing so we are not doing them a favor but ourselves since Allah has promised Jannah for helping the needy..
At that moment her sister came in with a gift cover and handed it to Aysha ‘’Aysha dear open it, it’s yours ‘she said. Aysha opened it to find two gifts inside, one was her salwar but the other gift something even more precious that she felt so happy to own it, it was a small Quran for herself. Aysha was so happy that she wore her new salwar and went to join her dad for prayers. Her little mind was still bothered about those kids on the streets who have nothing to eat at all. ‘’I will provide the poor with whatever I have in hand, In sha Allah’’ she promised herself. The Beauty of Covering up is the Author’s humble attempt to create more awareness of the importance and virtues of observing hijab, not only the physical hijab, but also observing hijab in the way we think and act as Muslims and as human beings i.e. we must inculcate good manners and character; and have good thoughts which are pleasing to Allah (swt). I think this was the consistent message emphasised and encouraged throughout the book. I was impressed with its quality and presentation – hard cover with glossy patterned pages and each chapter is represented by a different colour, giving the book a very feminine and young feel. There is also a dust jacket which is great for protecting the cover, and both back and front flaps contain biographical information about the Author which I totally enjoyed reading. The book also comes with its own bag – a lovely pink bag of good quality. The Author’s style of writing is simple and to the point making it a quick and easy read. And I got the sense of the Authors personality and voice, and there is some indication of the her Chinese cultural background. There are several quotes from the Holy Qur’an and Hadith in support of hijab along with personal stories from Muslim women. And I think it was obvious that Abdullah wrote this book with the Muslimah revert/convert in mind. Hence, its simplicity and to the point style. The Author being a revert herself. My favourite chapters were ‘You Are Beautiful!,‘Beauty from Within’ and ‘Striving Towards Modesty.’And I really liked and appreciated the fact that the Author pointed out that observing hijab is also a religious requirement for Muslim men, a message I feel has been overlooked by many Muslim leaders and writers on the subject of hijab. Then the final chapter has several design illustrations of the different ways Muslim women can observe the hijab like ”youthful and active fun to wear design” ideas and “lose and dramatic Ethnic style in simple and bold prints and trimmings” ideas amongst others. I would recommend this book to any non-Muslim and new Muslimah reverts who desire basic knowledge and understanding about the hijab. Nourishing Ng Abdullah has also written many articles for various Islamic non-governmental organisations (NGOs) over the years. She resides in Kuala Lumpur, Malaysia where she is actively involved in several Islamic Non-Governmental Organisations and is currently, Head of the Agama Bureau of AMAED – Association of Muslim Apparel Entrepreneurs and Designers, Malaysia. She was invited by the President to share her knowledge and to gently guide designers and members to change their attitude and focus on transition towards producing proper Islamic attire. She is also Vice President of Persatuan Darul Fitrah of Malaysia and Committee Member of Perkim Cawangan Bangsar as well as the Malaysian Chinese Muslim Association (MACMA) – all three NGOs offer support to reverts/converts to Islam. Review provided by Zainab John, Founder and Club Leader of Muslimah Voices Book Club (MVBC) – new book club for Muslim women. Copyright 2013, Islamic Lifestyle Magazine. All rights reserved.